Bikes: Rideable; 83 Schwinn High Sierra. Two cruiser, bmx bike, one other mtb, three road frames, one citybike. Me and some friends ran across a baskart one day going to a church to get food. I figure since the thing has yet to be stolen, I can use it with one of my crap frames to build a cargo trike. Shouldn't be too difficult to do. My plan is the use a fork and figure out how to weld it directly to the baskart in a way that it's solid but still be able to seperate the two halves if need be. Also some way to connect the two where the bikes handle bars would be originally, so there's no risk of buckling. So this would be; the forks dropouts welded to the lower crossbar of the baskart, somehow welding the middle of the forks to the baskart frame, and then somehow connecting where the bikes handlebars would be, to the baskarts handlebar(which would probably need be a bolt-on affair) as a third connection. I'm also trying to figure out how to add a steering stabilizer to help prevent jackknifing. 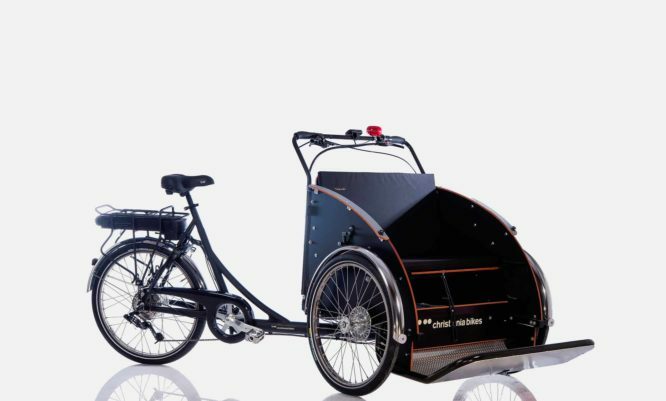 The other thing is using bike forks mounted to the baskart for front wheels in some fashion, so there will brakes on what will probably be a 90lb unladden trike. I'm on the fence about using 20" or 26" wheels. The bike frame going to be used in question will be a Roadmaster Granite Peak. Then I can figure out how to give it some sweet lighting and maybe a stereo. I'm thinking about using a triple tree style fork and getting some pipe that'll fit in it. It'd be cool to give it front suspension, too. Like maybe a set of elastometers like used on some car trailers or vw style swing arm set up. Keep in mind that many shopping carts you see on the streets have actually been stolen from local grocery stores. If your cart has identification on it, you can call the store and they may send someone to come pick it up. If the cart is completely trashed... then it may not be worth much for the store to recover... thus good for projects (keeping in mind that it may have begun as stolen property). Oh, one other thing, be careful with welding chrome. You might look up more information about chrome. 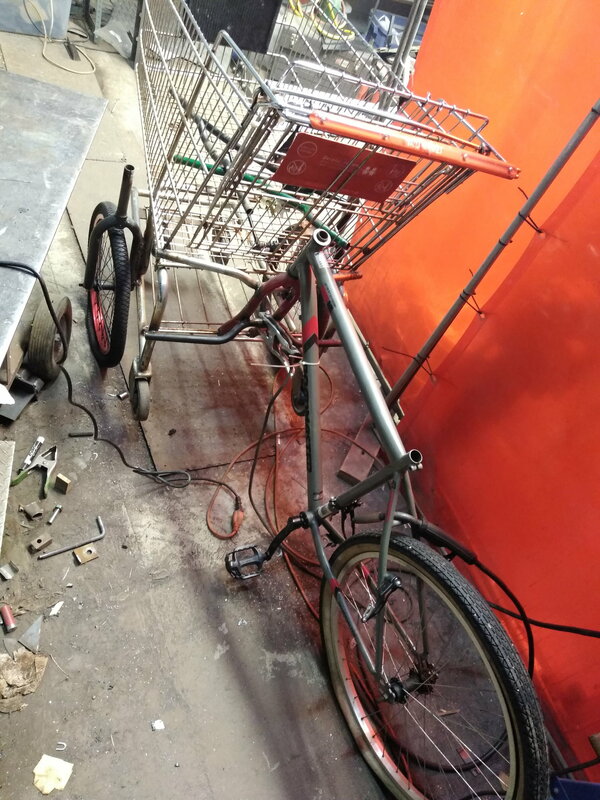 If you are comfortable with welding and fabrication, you may choose to build your own trike frame, then just use the shopping cart basket. It's an old baskart. I understand that it could've been stolen at some point and I know where it came from. I guess it's beat up from it's hard life on the city streets. lol. We've had this cart for a few weeks and we use it to get food from this church. Cops have seen us with it. Chrome has a bit .ore outgassing but people regularly weld on it. I figure if it's grinded on some, it'll be easier. The place I'm going to try and take it to, has an acetyline torch welder. I think. I want to keep the bottom platform since it's not a standard size baskart like say you have at walmart. It's small. Once it's completed, I'll have a way to transport my trailer parts to have them done up, as well. I took the bikes apart I needed parts from last night and I should be able to weld the fork dropouts in to the crossbar by the car wheels, the small bar people stand on, And I have some steel handlebars that'll be welded to the brake bosses and then to the frame. Then I just need to figure out a removable top support that would go where the bikes handlebars would be, and a steering stabilizer or two. So I have this thing basically together, I just forgot to come here. 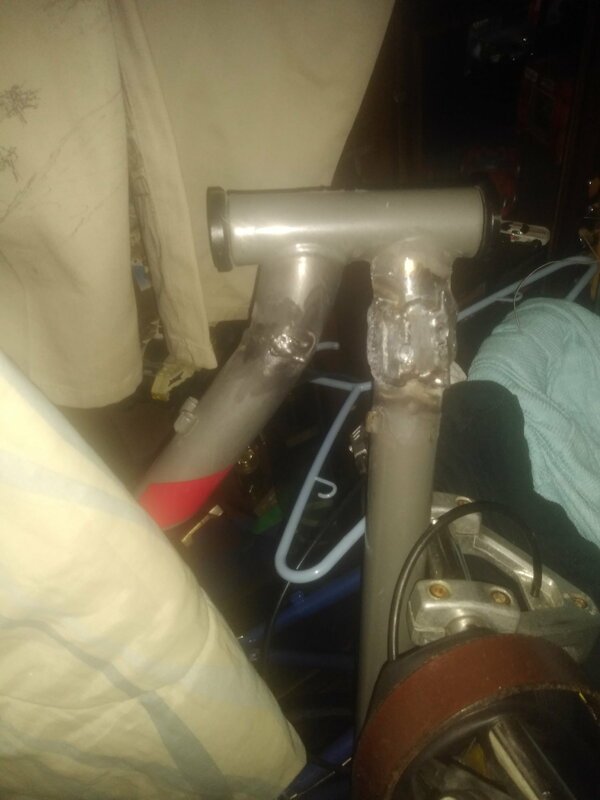 I believe we managed to get the bmx forks welded on even and it was my first time ever welding. I did screw up and forgot to take the rake out of the bike frame and fork, and I gotta figure out how far to pie cut the top tube and how much from the downtube to cut out. After that; I can sort the brakes and other stuff. A Christiania trike has a box with 2 wheels on it, and a hand bar across the back , but there the head tube angle is near vertical..
Cristiania is a free city portion of Copenhagen Denmark..
here (english language ) is the nobox version, where you see the steering pivot is now centered under the load. Last edited by fietsbob; 01-09-19 at 04:36 PM. Work on it has been slow, the place I work at it on only has one night a week for free memberships and I can't always go. But I managed to get back up there and get the rake out the frame. I had a bit of help with it, a guy cut up this flat stock in to sections and we welded it where the top tube was cut out as sort of a permanate coupler with about an inch or so overlap. I'm going to go down there and grind the welds smooth and add some bracing. I pie cut the downtube and if any of that flatstock is left, I'm going to do something similar with the downtube with longer pieces. It seems sturdy enough as is, but a bit of overkill won't do anything but add a bit more wieght to it. What I'm thinking is taking one or two plates, cutting them to fit in that front part of the triangle by the head tube. And/or running some bar from the headtube down to the middle-ish of the top tube. Next is getting it rideable, so it can be taken back down there and the rake taken out the fork. I drive a Neon, so I can't drive it down there. The only other option is to finish my bike trailer and tow it, which would set me back a few, since there is many things I need to get that finished; Wheels, forks, bar stock. Once there's tubes in the front wheels, we can see how level they are, the drop outs are different, so we had to do all measuring from the fork necks. I'm going to add bracing to the forks, as well. When I was there, I discovered they have a tube bender, might help some. Let's see... ah yes; welding handlebars to it. After that, it's figuring out how to paint it, I don't want to pai t most of the baskart, as it's chrome is shiny and makes night riding safer. Run brakes, possibly a parking brake lever, then tastefully light it up like a xmas tree. Fenders and hopefully steering stabilizer. I'm pretty proud of myself; this is the biggest project I've ever done, basically building something from the ground up. Last edited by Jax Rhapsody; 02-24-19 at 02:37 AM.